Der Hojicha ist ein gerösteter japanischer Grüntee. Durch die Röstung schmeckt derTee weniger bitter und ersetzt den typischen Jodgeschmack des grünen Tees durch ein einzigartes leicht karamellisiertes Aroma. Hōjicha is often made from Bancha (番茶, "common tea") – the larger tea leaves (firmer leaves, not buds) and stems from the later harvest of the season which contain very little caffeine. In modern day Japan, Houjicha is produced first by mixing tea leaves and sands in the roasting oven. The sand serves two purposes: to make the tea roast at an even temperature and to prevent the leaves from sticking together. 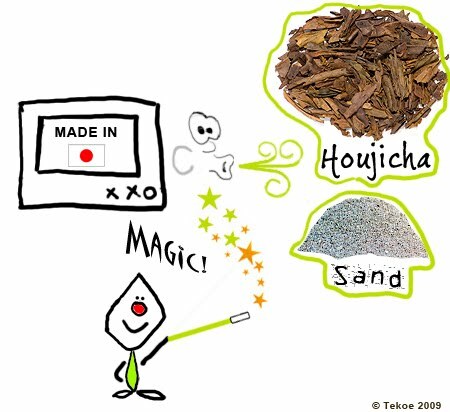 At the end of the completely automated process, the leaves are magically separated from the sand through a blowing mechanism and you will never find one grain of sand in Houjicha. This comes as no surprise from a country of Sony and Toyota – a land that has perfected precision manufacturing and automation while still keeping its tradition.